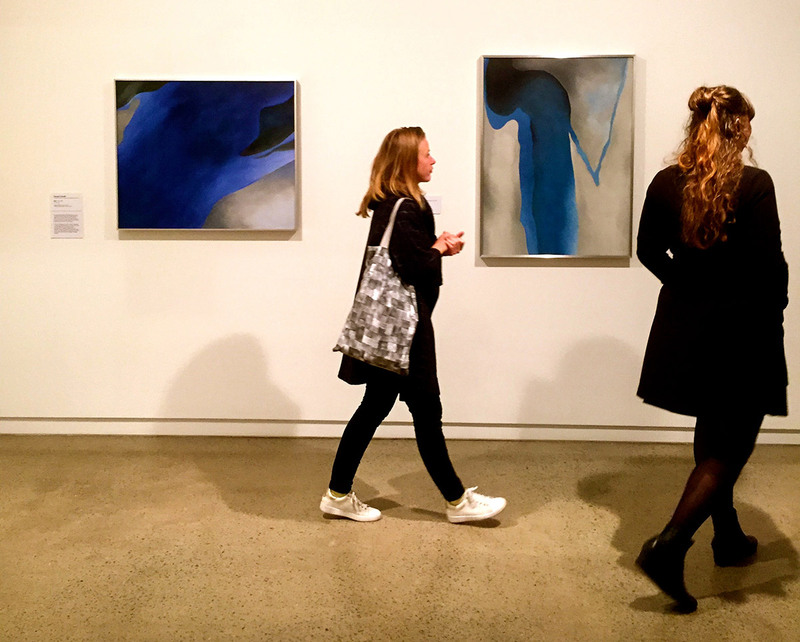 Avec Pleasure’s November and December ‘Collector’s Club’ walk throughs of Heide Museum of Art’s exhibition, ‘Making Modernism’, have been very well attended and a delight to run. Attending this exhibition as a group allowed us to share the inspiring experience together and also share a lively group discussion afterwards. They have been a rare opportunity to simultaneously view the selected and inspiring works of O’Keeffe, Preston and Cossington-Smith. ‘Making Modernism is about three remarkable artists. The joining of these artists for exhibition is unusual in that they are not bound by any personal familiarity or direct correspondence… Innovative pioneers, each forged a bold, original and independent path for themselves and for the art of their respective homelands’. ‘Modernism’ refers to the broad movement in Western arts and literature that gathered pace from around 1850. It is characterised by a deliberate rejection of the styles of the past; emphasising instead innovation and experimentation in forms, materials and techniques in order to create artworks that better reflect modern society. ‘Born in the nineteenth century, Margaret Preston (1875), Georgia O’Keeffe (1887), and Grace Cossington Smith (1892) each pursued a distinctive style of modern art expressive of their individual creativity and the particularities of living in Australia or the US… Inspired by the natural world, they transformed their observations into imaginative, abstracted compositions looking to European practices of art aspirations are a central theme to this exhibition’. For the sake of brevity, I have focused on presenting the attached bio and career information relating to Georgia O’Keeffe’s art practice and the important life-changes which shaped her art. 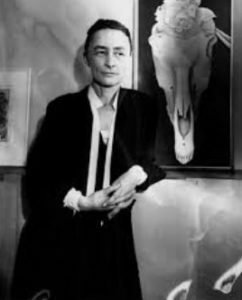 Georgia O’Keeffe may be the best known and least understood artist of the 20th century. (1887 – 1986 ) Georgia was born on November 15, 1887, in the town of Sun Prairie, Wisconsin. Her parents, Francis Calyxtus O’Keeffe and Ida (Totto) O’Keeffe, were dairy farmers. Her father was of Irish descent. Her maternal grandfather George Victor Totto, for whom O’Keeffe was named, was a Hungarian count who came to the United States in 1848. O’Keeffe was the second of seven children and the first daughter. O’Keeffe studied at the School of Art Institute of Chicago from 1905 to 1906. In 1907, she attended the Art Students League in New York City, where she studied under William Merritt Chase. In 1908, she won the League’s William Merritt Chase still-life prize for her oil painting Dead Rabbit with Copper Pot. Her prize was a scholarship to attend the League’s outdoor summer school in Lake George, New York. O’Keeffe abandoned the idea of pursuing a career as an artist in late 1908. She took a job in Chicago as a commercial artist. Georgia did not paint for four years. Georgia was inspired to paint again in 1912, when she attended a class at the University of Virginia Summer School, where she was introduced to the innovative ideas of Arthur Wesley Dow by teacher, Alon Bement. Dow encouraged artists to express themselves using line, colour, and shading harmoniously. 1912-14, she taught art in the public schools in Amarillo in the Texas Panhandle. She attended Teachers College of Columbia University from 1914–15, where she took classes from Dow, who greatly influenced O’Keeffe’s thinking about the process of making art. O’Keeffe had made some charcoal drawings in late 1915, which she had mailed from South Carolina to Anita Pollitzer. Pollitzer took them to Alfred Stieglitz at his 291 gallery early in 1916. Stieglitz told Pollitzer that the drawings were the “purest, finest, sincerest things that had entered 291 in a long while”, and that he would like to show them. Stieglitz organized O’Keeffe’s first solo show at 291 in April 1917, which included oil paintings and watercolours completed in Texas. Stieglitz and O’Keeffe corresponded frequently beginning in 1916 and, in June 1918, she accepted his invitation to move to New York to devote all of her time to her work. The two were deeply in love and, shortly after her arrival, they began living together, even though Stieglitz was married and 23 years her senior. That year, Stieglitz first took O’Keeffe to his family home at the village of Lake George in New York’s Adirondack Mountains, and they spent part of every year there until 1929, when O’Keeffe spent the first of many summers painting in New Mexico. Beginning in 1918, O’Keeffe came to know the many who were part of Stieglitz’s circle of artists, including Charles Demuth, Arthur Dove, Marsden Hartley, John Marin, Paul Strand, and Edward Steichen. Strand’s photography, as well as that of Stieglitz inspired O’Keeffe’s work. By the mid-1920s, O’Keeffe began making large-scale paintings of natural forms at close range, as if seen through a magnifying lens. 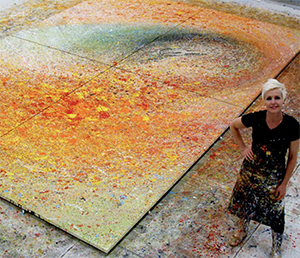 In 1924, she painted her first large-scale flower painting Petunia, No. 2, which was first exhibited in 1925. Georgia also completed a significant body of paintings of New York buildings, such as City Night and New York—Night (1926). Did O’Keeffe consider herself a feminist? O’Keeffe turned to working more representationally in the 1920s in an effort to move her critics away from Freudian interpretations. Her earlier work had been mostly abstract, but works such as Black Iris III (1926) evoke a veiled representation of female genitalia while also accurately depicting the center of an iris. 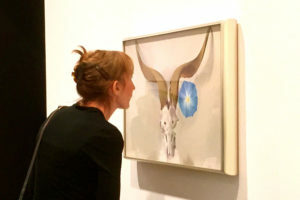 O’Keeffe consistently denied the validity of Freudian interpretations of her art, but fifty years after it had first been interpreted in that way, many prominent feminist artists assessed her work similarly; Judy Chicago, for example, gave O’Keeffe a prominent place in her The Dinner Party. Although 1970s feminists celebrated O’Keeffe as the originator of “female iconography”, O’Keeffe rejected their celebration of her work and refused to cooperate with any of their projects. In 1972, O’Keeffe’s eyesight was compromised by macular degeneration, leading to the loss of central vision and leaving her with only peripheral vision. She stopped oil painting without assistance in 1972, but continued working in pencil and charcoal until 1984. Juan Hamilton, a young potter, appeared at her ranch house in 1973 looking for work. She hired him for a few odd jobs and soon employed him full-time. He became her closest confidant, companion, and business manager until her death. Hamilton taught O’Keeffe to work with clay and, working with assistance, she produced clay pots and a series of works in watercolor. In 1976, she wrote a book about her art and allowed a film to be made about her in 1977. O’Keeffe became increasingly frail in her late 90s. She moved to Santa Fe in 1984, where she died on March 6, 1986 at the age of 98. In accordance with her wishes, her body was cremated and her ashes were scattered to the wind at the top of Pedernal Mountain, over her beloved “faraway”.